Alabama doesn’t have a large coastline, but the 32 miles of white sand and turquoise water south of Mobile are spectacular. They offer fantastic seascapes, rich wildlife in the Bon Secour National Wildlife Refuge, a laid-back atmosphere on Dauphin Island, and a lot of action in lively places such as the beaches of Gulf Shores. 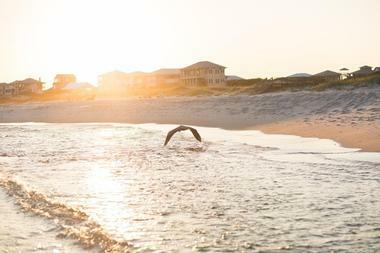 Located on Alabama's Gulf Coast, Orange Beach is one of the most beautiful beaches on this stretch of the coast. It has miles of powdered-sugar sand beaches that are not only great for stretching out in the sun, but also offer the opportunity to watch sea turtles lay eggs from May to October. 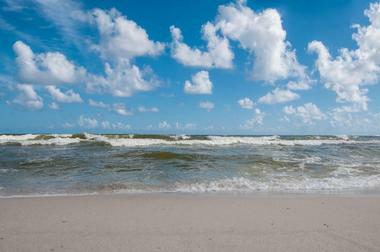 From the beach, there is access to the bayous and bays north of Perdido Pass. Visitors who need a bit more action can join a fishing charter, take a dolphin watching tour, play golf, or enjoy birdwatching on the Alabama Coastal Birding Trail. This nice small beach area is snuggled among some very popular condominiums, at the intersection of Highways 182 and 161, a perfect place for all sorts of activities or just relaxing and people watching. The beach is close to the parking lot and it has all the essential amenities, such as restrooms and outdoor showers. 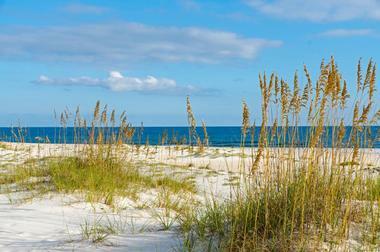 This beautiful white sand beach on the Gulf of Mexico can get crowded at times, so come early to find a nice spot. The shallow water is perfect for the kids, although dogs are not allowed. The beach is a very popular spot for wedding pictures. Dauphin Island is a small barrier island on the Alabama coast on the Gulf of Mexico and is known as a perfect family holiday destination. Quiet and peaceful, the island’s entire west end consists of miles of powder-fine white sand. The long and narrow beaches are perfect for strolling along the surf, making sand castles, or simply cooling down in the water. Along the beaches visitors will find lovely parks shaded with ancient oaks in addition to public golf courses. It is the only pet-friendly beach in the entire area. The off-shore fishing is also great. There is another public beach on the west end of the town of Dauphin Island, known for regular summer live music concerts. Fairhope is a small, bohemian town located on the shore of Mobile Bay, on the bank of a large estuary that connects with the Gulf of Mexico. Surprisingly, in spite of its location on the brackish waters of the estuary, the town has a few small yet lovely beaches. One of these is located north of the popular pier and just behind the beach on a high bluff there is a nice grassy area that is perfect for picnics, with wonderful views of the ocean and large trees that provide shade. The area has a lovely breeze that cools hot skin on a summer’s day, but the waves are always moderate and kids love it. 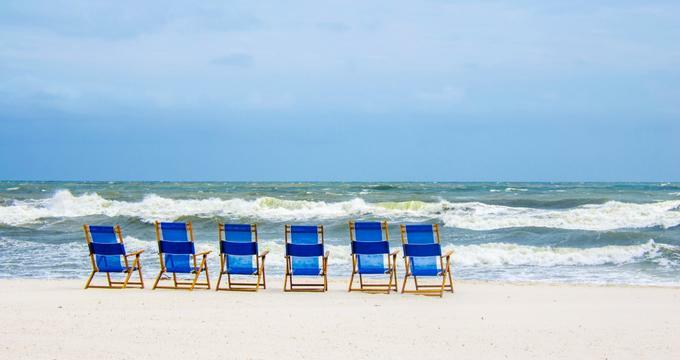 Located only 3 miles from Perdido Pass Bridge in the town of Orange Beach, Alabama, Florida Point Beach is a lovely 6,000-foot-long stretch of fine white sand that runs along the turquoise waters of Florida Point. There is a popular boardwalk along the beach as well as several picnic areas and a few outdoor showers. The beach is very popular, so if you want to find a more secluded and private spot on the sand, take a little longer stroll among the dunes and you might find a perfect place just for you. Parking at the beach access is free. 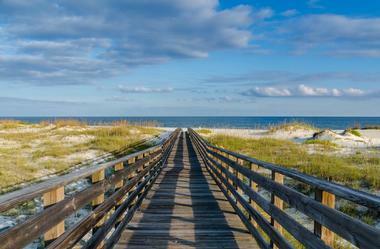 The Fort Morgan Peninsula sticks like a finger west from the Alabama Gulf Shores and is perfect for those trying to spend some time on the beach away from the more popular spots full of beach bars and souvenir shops. A large section of the peninsula is located within a protected wildlife refuge, and its beachfront is about an hour’s drive to any store, but the privacy it affords is well worth the isolation. The beaches are pristine, covered with fine white sand, and are free to access. Finding them can be little tricky and most are part of private hotel accommodation. Two public beach access points are within the Bon Secour National Wildlife Refuge, 1.5 miles after the visitors center. There is an unnamed public beach access at the end of the peninsula, outside the Fort Morgan State Historic Site. White sand beaches and clear turquoise waters attract thousands of people to Gulf Shores on the Alabama coast of the Gulf of Mexico. Swimming, sunbathing, boarding, and walking along the surf are just some of the activities you can choose here, and there are 32 miles of breathtakingly beautiful beaches to choose from. The sand on the beaches is made almost completely from quartz that came down from the Appalachian Mountains thousands of years ago. The sand is soft and cool underfoot and it makes funny squeaking sounds when walked on. There is a lot of action on the beach, from volleyball games to nice little beach bars. Gulf State Park has over 3 miles of wonderful fine sand beaches, perfect for relaxing in the sun, cooling off in the surf, listening to the sea gulls, or collecting sea shells. 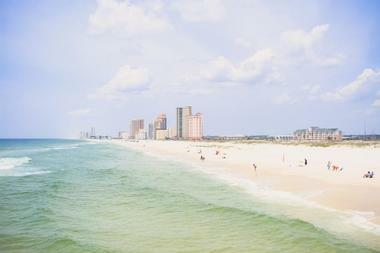 Some beaches are located in the town of Gulf Shores, near a charming pavilion. 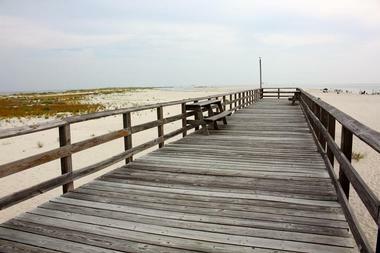 Another beach access point in the park is at Orange Beach. The park’s beaches are popular for surf fishing, kayaking, or just relaxing on the sand, and park staff offer a schedule of fun activities every summer, such as geocaching, guided nature walks, and stargazing. The park has 20 cabins and 11 lakeside cottages next to the golf course, a short drive from the beach. The Bon Secour National Wildlife Refuge spreads over 7,157-acre on the scenic Fort Morgan Peninsula west of Alabama Gulf Shores. The refuge provides protected feeding and resting areas for a range of migratory birds and is a sanctuary for diverse local native plants and animals. It is one of the biggest undeveloped stretches of land on the coast of Alabama. The refuge is divided into Perdue, Sand Bayou, Fort Morgan, Little Point Clear, and Little Dauphin Island. The refuge protects a range of habitats, among them beaches, scrub forest, sand dunes, freshwater swamps, salt and freshwater marshes, and uplands. Some of the endangered species that live in the refuge are the Alabama beach mouse and sea turtles – green, loggerhead, and Kemp's ridley. Not far from the popular and noisy beaches of Gulf Shores, the beaches in West Beach are less touristy and more quiet and relaxed. On one side they are lined with luxury condos, private homes, hotels, and restaurants, while on the other lie the turquoise waters of the Gulf of Mexico. Miles of fine white sandy beaches are open to the public. Located on the Fort Morgan Peninsula, which stretches all the way to Mobile Bay, the beach in West Beach is separated from the bay by a small lake named Little Lagoon. The Fort Morgan Peninsula is home to the Bon Secour National Wildlife Refuge, a large habitat that provides a home to endangered sea turtles, the Alabama beach mouse, and migrating birds.